We all know the feeling. You come across a word you’re not sure of. You take your dictionary, find the right place – but the word’s not there! If this sounds familiar, pause before you write off your dictionary as being no good except as a doorstop. Bear in mind how modern dictionaries are made and why, therefore, a word such as ‘organdie’ (‘a fine, translucent, stiff cotton muslin, used chiefly for dresses’*) would not be in a school dictionary. 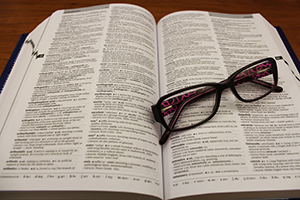 Modern dictionaries focus on the words that people use most, as these are the ones they most often need to understand and use. As a school dictionary focuses on core vocabulary, words such as ‘organdie’ will not appear in them – but you will find them in a reference dictionary such as the Oxford South African Concise Dictionary, an adult dictionary that can be used by a child with the help of an adult to check the meaning of more advanced words. The advantage of a school dictionary is that the font, the way that words are defined, and the illustrations have all been designed to be used by young children so they can do so without adult help. While a bigger dictionary for adults will definitely cover more words, it may not do so in a way that children can use on their own. The definitions may use vocabulary that they don’t understand, the selection of words might be inappropriate, and the layout may make the dictionary unappealing or difficult to navigate. So the best situation is to have a school dictionary for the child to use alone (and take to school), and a reference dictionary that stays at home, available for the child to consult with an adult, to look up the words that cannot be included in the school dictionary because of their infrequent use.